Writing has always been a part of my life, from writing short stories as a child to embarking on a career in journalism at the age of 19. I was introduced to calligraphy by my art teacher at secondary school, himself a talented calligrapher. At the time, it brought my two favourite subjects – art and English – together. My first commission came from a family friend who was getting married and I remember receiving a Take That poster as payment for writing her invitations. Fast forward a decade or so and I started getting my calligraphy pens out more often as my friends started getting married and I was tasked with writing invitations and table place cards. This time I was paid in wine and chocolate! 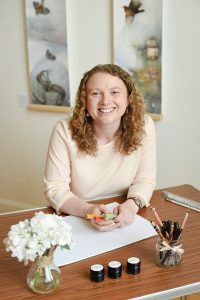 The idea of turning my creative hobby into a business popped into my head around this time, but life got in the way as I got married myself and started a family. When I took voluntary redundancy in early 2014, after working for almost 13 years as a journalist, the idea crept back into my mind. Creative Calligraphy was launched in May 2014 and continues to flourish (pardon the calligraphy pun) as I expand my skills and knowledge. Aside from calligraphy and writing in general, my loves include my husband Michael and our two children, James and Sophie, our wider family and friends, coffee and cake, stationery, superheroes, music, swimming and reading. I still like wine and chocolate, but I prefer the Foo Fighters to Take That these days!